It doesn’t get anymore British than this, because England actually has a National breakfast. There are usually 5-7 items that make up a full English breakfast depending on which items are included. If I’m going for it, I’m going for all 7. Here’s how this massive breakfast shapes up. American bacon is not allowed here. I love American bacon, it’s just not the right kind for this Full English Breakfast. What is American bacon? Isn’t it just, bacon? Yes, but in England we eat back bacon (cut from the back). It’s very much like Canadian bacon, as it does not crisp up like American bacon that is streaked with fat and cut from the belly. Back bacon is very ham-like with the fat around the edge and unsmoked. Beans for breakfast? Sure, start the day with fiber. Baked beans, just like American barbecue beans without the barbecue flavor, they are just in a plain tomato sauce. Canned is allowed, or you could make your own. Here’s my recipe > British Baked Beans. Buttered toast is acceptable, but if you’re going all out you really need fried bread. What is fried bread? It’s white bread fried in vegetable oil until golden brown. That’s about as simple as it gets. No one said this was a healthy breakfast. I know what you may have heard, but it has flavors and spices that make it taste really good. It’s a sausage not a pudding and not always served with the breakfast both in England and Scotland. This full English breakfast recipe was first featured on Food Fanatic, where I am a contributor. If you’ve tried this Full English Breakfast or any other recipe on the blog then don’t forget to rate the recipe and let me know how it turned out in the comments below. I love to hear from my readers! Heat a large frying pan over medium heat and brush with vegetable oil. Add the sausages to the pan and cook until browned on all sides, about 10 minutes. While the sausages are cooking add the bacon and mushrooms to the pan. Cook the bacon for 3-5 minutes per side and cook the mushrooms until browned. 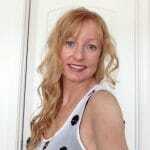 Looking great, Jeanette. Loving the copper saucepan for the beans. Never have they been treated so well. Such a great post! Never had a real English Breakfast, but would love to try it! This looks wonderful, Janette! I love a great, hearty breakfast – especially with the cooler weather coming. 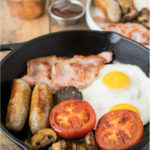 I have a dumb question – a few years ago when we were in Ireland, we often had a full Irish breakfast in the mornings (black sausage and all – yum) 🙂 An Irish Breakfast and English Breakfast appear similar – is there a distinct difference? Either way – a fabulous way to start your morning! That’s a lot of food! I’ve never seen the black sausage before. Interesting. I love a full English, but it really is a rare treat – usually cooked for me by someone else. This looks like a great way to start the day! Being a savory girl, I love this kind of meal! This looks hearty and delicious! I really want to try that black sausage – we have something in my family called boudin noir – made from pigs blood and scotch bonnet peppers — it’s spicy and so freakin’ good! Would love to try this breakfast!